Round 2 is in the books. It was ferocious and it appears that some of our contestants are growing stronger like this season of The Wire (that’s a complete fabrication as I have not yet dabbled in the show; yet making Wire references in sports columns is en vogue so please understand that was my attempt at a contemporary simile). Frightening. Bozo stumbled out of the gate which, to the untrained eye, appeared to be a rope-a-dope but in reality it was just a vicious hangover. Per the typical KO aesthetic, this was a grind it out defensive bore that he won on underwhelming things like technical jabs, timely stoppages, and crazy hair. And, if you’ll recall our match preview, we likened this bout to Voldemort v. Potter and how Harry was channeling all that love from his family to overcome the pure evil of He Who Must Not Be Named. Remember? Well LoRo couldn’t channel enough Seattle basketball love what with KD5 and Westbrook scoring a combined 57 in the All-Star game and Durantula taking MVP honors home. Salt, meet wound. 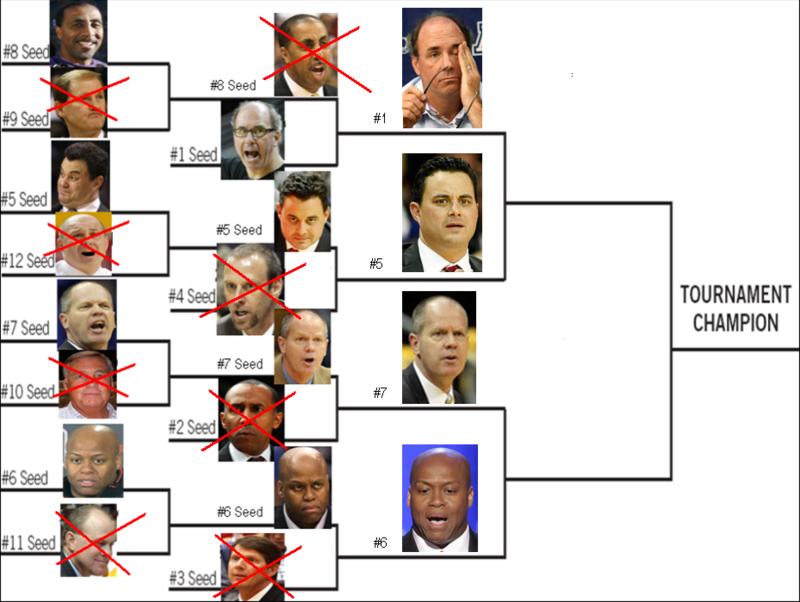 The round’s second fight featured Whooping and K. Know that Sean Miller does his homework. He knew what he was up against and knew it would take great effort to upset the fourth seeded, 6’9″ beast of Montana Grizzlies-lore. In this tilt, Miller was undersized and understrengthed. He was essentially destined to lose. But he didn’t. Despite all of K’s confidence, preparedness, and viciousness, he forgot one very important fact and Whooping leaves no stone unturned. Whooping discovered, following extensive research, a home visit, and lots of bribery, that K once, on his seventh grade B team, dropped a pass from a teammate the resulted in a turnover. Sean doesn’t like dropped passes. Subsequently Sean rolled K, 254-76 (most votes single round votes, all-time). Our third bout kinda breaks my heart because maybe he can’t help it? Maybe Johnny Dawkins wants to smile but he just can’t? Alas, the beating Tad put on Johnny (229-53) would be enough to make anyone never smile again and I imagine the Cruel Cardinal is now legitimately incapable of such. The meat paws of the Colorado Cranium were once again overwhelming to a Bay Area head coach as Big Boyle advances. Plus you must keep in mind that this is a “no holds barred, rule-less, lawless” tournament so it should come as no surprise that this is happening. Eff ’em up, eff ’em up, GO CU! The closing match of Round 2 featured a peripheral, side-battle of sidekicks. The Capacious Corvallian, with a suspiciously large entourage of stoic square jaws with impressive GPAs from renowned universities, found a way to do what the Headless Horsemen could not: defeat Ichabod. It wasn’t easy – or pretty – but big Craig came out the winner. I don’t want to know what or how the secret service handled Miyagi but he was rendered a non-factor in this match. It’s one of those DADT situations we don’t need to meddle in. Congratulations on the win, Craig. Next up? The semifinals open 3/5.